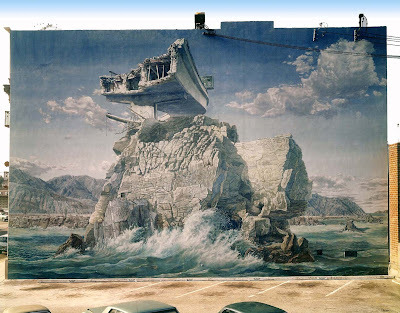 One of the most famous of all Los Angeles' murals is "Isle of California" (1972), the work of Victor Henderson, Terry Schoonhoven, Jim Frazin of the L.A. Fine Arts Squad. While some of L.A.'s most visible murals, especially those along freeways, have been destroyed by vandals and taggers (subject for another post) "Isle of California" is suffering a different fate. 38 years of exposure to the sun and the elements have taken their toll - this amazing mural is slowly fading away. "Isle of California" is a mythical vision from the California/Arizona border when California becomes an island after "The Big One" (the term used to described a future major earthquake). 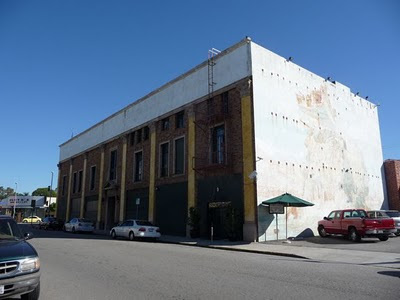 The mural is located at The Village Recording Studio at 1616 Butler Avenue, literally just a few feet away from Santa Monica Blvd in West Los Angeles. 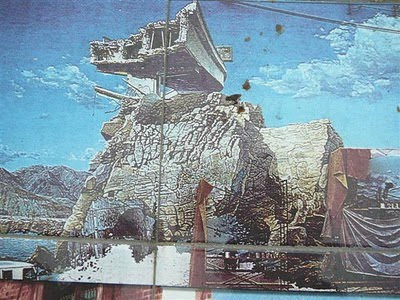 If you want to see what "Isle of California" originally looked like, head on down to the Venice Beach. There's a much smaller version of the mural featured in some tile work along the Boardwalk. And I found a color photograph on another website: federicodecalifornia.files.wordpress.com. This is what "Isle of California" looked like 30+ year ago. Amazing - and sad. Do you know where the tile is in Venice Beach? Nice job bringing up the subject of this mural! It was an icon of LA in the 70's. THANKS! 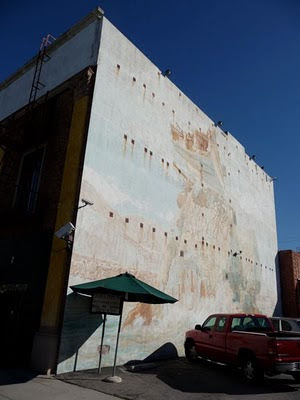 I do mural restoration/conservation and am working with Caltrans right now (went out with Vincent Moreno today!) 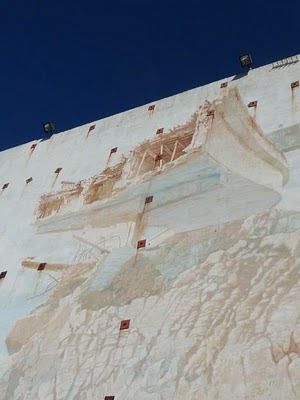 to see if we can make progress on the freeway murals. thanks for your comments here (and elsewhere) Scott adn the link to your blog. 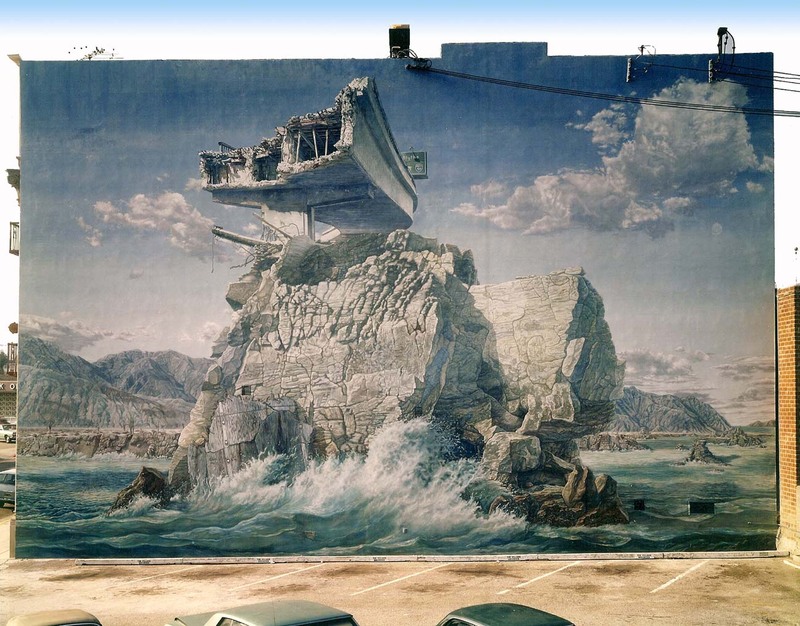 Isle of California - amazing mural. Love to see it restored to it's former glory. 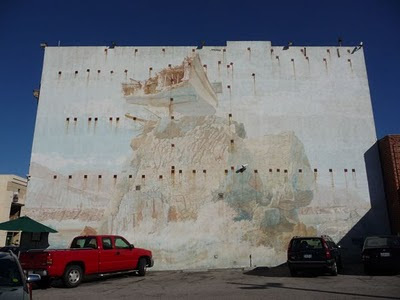 Depressing seeing how other murals (mostly on freeways) have been destroyed by taggers/vandelism. Subject for another blogpost, I suppose. Really faded. I think I was 11 when this mural first went up. Hope it get's restored. Maybe helps that it's just a block from West LA Police Dept - keeps tagger scum from destroying it. Thanks. Featured in Quicksilver http://www.imdb.com/title/tt0091814/ as the epiphany shot giving Jack Casey (Kevin Bacon) the idea suggesting the end to Gypsy's (Rudy Ramos) climactic chase. I know. And we sued them for using it without our permission. Victor Henderson; Founder of the Los Angeles Fine Art Squad. Sad that it's fading. I made a special effort to visit it when I first went to LA in '78. Amazing work.